F.S Form 20. Issued to a pilot, Lieutenant L.W. Savidge whilst he was at No.30 T.D.S during September 1918. It details the kit issued to him including 'leather jacket, 'Boots, Thigh' (Fug boots), 'Gauntlets, Pilots', 'Cap, Fur-lined', 'Goggle Mask', 'Glasses Triplex', 'Suit, Sidcot' etc. 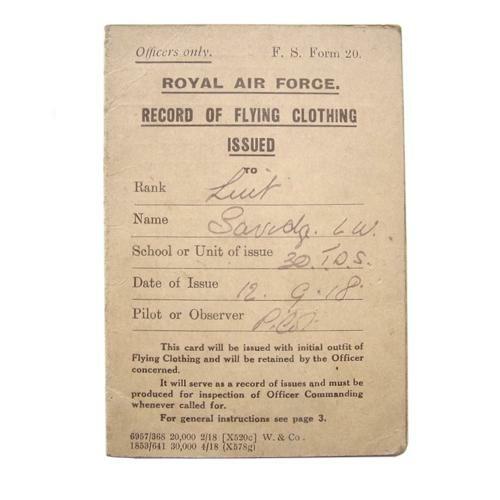 Fascinating little document issued to a pilot during the infancy of the RAF. Lightly soiled but in good used condition. Stock code P22999.